The Division Bench of the Allahabad High Court today upheld with some modifications its last year’s single-judge Bench judgment terming as ‘unconstitutional the granting of minority status to the Aligarh Muslim University and 50 per cent reservation to Muslims. Yoga guru Baba Ramdev’s supporters shouted slogans against the allegations that his ayurvedic drugs contained animal and human bones and clashed with the police and CPM workers in the Capital today as they tried to storm the party headquarters resulting in a mild lathi charge and detention of 30 persons. Should punishment for the corrupt be made more stringent? Shying short of admitting that the indigenously-built Advanced Light Helicopter Dhruv had been grounded the Ministry of Defence officials today said that thorough checks were being carried out on the chopper which was being inducted into the armed forces and offered for sale abroad, following the crash of one of them in Hyderabad recently. Even while the Amar Singh phone tapping controversy continues to rock the Central Government, Tamil Nadu Chief Minister J. Jayalalithaa today dropped a bombshell alleging that her telephones were also being tapped by the Centre. Israeli Prime Minister Ariel Sharon was in "grave" but stable condition today after undergoing a seven-hour emergency surgery to stop "massive, widespread" bleeding in his brain, plunging the Jewish state into political uncertainty. It also raises the question that if it can happen to Mr Amar Singh, it can happen to every opposition leader in the country. The Supreme Court today gave a green signal to the Himachal Pradesh Government to reconstitute the State Electricity Regulatory Commission (ERC), virtually throwing out of office its incumbent Chairman S S Gupta, currently heading the one-man panel. 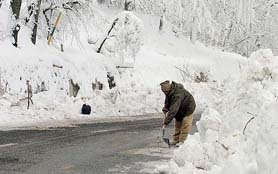 Even as the authorities claimed to have accelerated restoration work following heavy snowfall in Kashmir, life in the valley remained paralysed for the fourth consecutive day today due to freezing cold and drinking water shortage, power failure and icy roads.